Thanks to the kindness of my friend, Bolts, I was able to attend a second show during the Zip Code Tour. Financially, it had only worked out for me to see the Pittsburgh show originally, because tickets as you all know are NOT cheap (if you're spoiled like me and wanna be in the front anyway). But thanks to a Friends and Family pass I was able to come to Buffalo, and thanks to my BFF's Isabel and Susan, I was able to room share and split hotel costs. The 3 hour drive from Pittsburgh to Buffalo was the easy part! 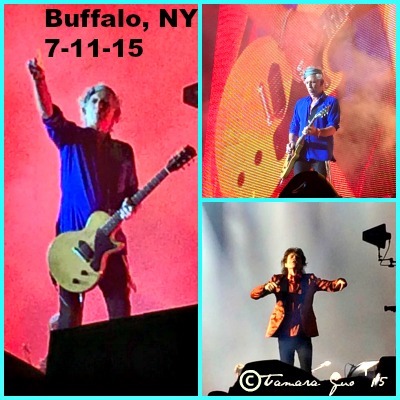 Unlike the rain we had until show time in Pittsburgh a few weeks prior, the weather in Buffalo on July 11 was perfect. Sunny and beautiful. I hung out with my friends at the hotel until about 3pm, and then I drove to the stadium for soundcheck. It took forever to get a parking space, because everyone in Buffalo was tailgating and the stadium is oddly in a residential neighborhood, so traffic was gridlock (even 6 hours before the Stones were due on stage). I ended up paying $20 to park on someone's lawn! Then I walked about a mile to the stadium, making several loops before finding the correct door where I could enter early with my pass. Once inside I strolled around the stadium floor and took a few photos and then grabbed a seat near the mixer boards for soundcheck. Patti, Theo and Alex were there, as was Keith's grandson, Orson. Also in attendance at soundcheck was Brian Ray (Paul McCartney's guitarist) and Andy Babiuk, author of Stones Gear. This was the last US show of the Zip Code Tour, so we got to watch the end of tour Stones personnel photo being taken. Everyone who worked for the Stones gathered on the stage, and that's a LARGE crew, including the Stones themselves and a photog climbed a ladder and took a few snaps. Sound check began with a run thru of Tumbling Dice, then Wild Horses, Let's Spend the Night Together and You Can't Always Get What You Want with the full choir. This was my second soundcheck, Pittsburgh a few weeks ago being my first. I was invited to soundcheck way back in 2003 in LA, but ended up not being able to go because Bill Clinton was attending and Secret Service would not let any riff raff like me in. I was SO disappointed. So soundcheck had been on my Stones bucket list for 12 years! Soundcheck is closed and the 2 I attended only had family and maybe 5-8 other people there, so it was an EXTREME privilege. I think the coolest part about soundcheck is just seeing the Stones be THEMSELVES with each other. Ronnie ran out to the end of the catwalk. They were laughing with each other on stage. Mick strolled around with a parasol due to the sun! It's just a side the public rarely gets to see. After soundcheck I ran into sax player, Tim Ries and said hello and we took a picture together. Post sound check, I was told I could mill around backstage, with the exception of the dressing rooms and on the stage itself where escorts are required. I walked all around the outside and back of the stage area. 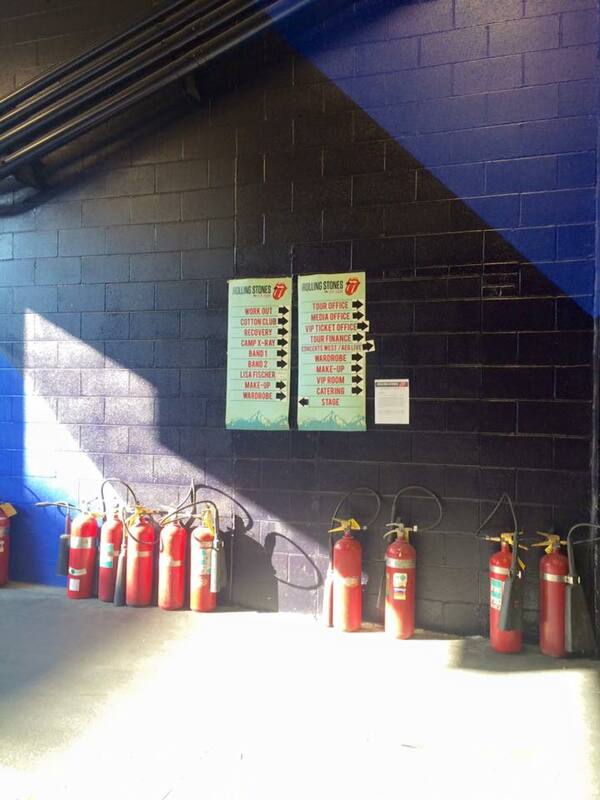 Checked out stadium views from various places...this is all prior to doors opening, so "This Place is Empty". Then I was treated to a ticket to eat in Band Catering. In the "old days" Band Catering used to be the "Band Lounge" aka "Shebeen" aka "Rattlesnake", where fans with band lounge passes could indulge in a buffet of the food that is served to the band and crew. Not anymore. That came to an end in 2012. While a band lounge still exists, and is very much like the Rattlesnake with cool decor and swag, it is now not open to the public and there are no longer passes for it. It is for band, crew and their family and friends only. So, again, riff raff like me being treated to band catering was a major perk. I am always SO nervous back stage, so not very hungry, but I did have a few bites and a soda (oh yeah the lounge is now DRY for some obvious reasons). Patti Hansen was there, Georgia May Jagger was there, as was Charlie's granddaughter Charlotte. I said hello to Patti & I kept to myself and just observed. I don't feel right asking family for photo ops, although I know they are pretty ok with it and sometimes more than happy for it. Out behind catering was the Pyro area where all the fireworks they set off after the show are located. I saw that on my way to the VIP Lounge where all my friends were waiting. We grabbed a table, said hello to some folks we had not seen since the previous tour and had a few adult beverages. The VIP was packed. When it was time to head down to the floor for showtime, I made a last restroom pit stop and upon exiting ran into Ritchie Sambora and his girlfriend Orianthi! Got a few pix of them, as they were walking to the floor from the backstage area directly behind me. This was the first time I was ever at a Stones show where I did not have an actual seat, and that was legal! So I strolled around the floor before the Stones came on and eventually just stood on the far railing on Keith's side so that wasn't blocking any fans who truly had paid for those seats. It was a truly unique view of things. And I could move around without fear of being scolded by venue security. The Stones have just been on fire this tour. Dare I say, in their 70's Mick and Keith are better than ever?! I honestly thought they were better on the Zip Code Tour in 2015 tha they were at the 50th Anniversary shows of 2012 and 50 & Counting shows in 2013. 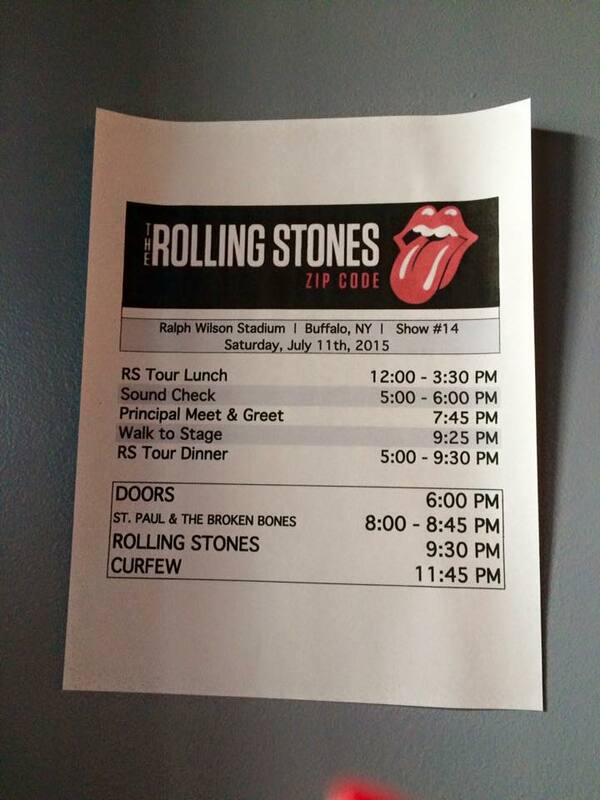 And this was my 81st Stones show! It was kinda cool because I more or less became a fan in the summer of 1981 during Tattoo You. The show started at 9:25pm and the boys burst onto the stage opening with Jumping Jack Flash. This time I didn't look at the setlist pre-show, so after IORR, hearing "You Got Me Rocking" surprised me. It's a quick tune, but it gets the crowd involved right away with the "hey, hey, you got me rocking now! ", and there was no shortage of audience participation. Tumbling Dice was followed by a tune I loved during Bridges to Babylon and No Security-Out of Control. There's just something about it, and it's been a long time since I heard that one, so it was a stand out for me. Wild Horses was the first song wanted to hear when I first got to see the Stones live in 1994 and it still brings a tear to my eye. And who can argue with Can't You Hear Me Knocking? I've now had the pleasure of hearing that more times than I ever expected (including having Mick Taylor on guitar in 2013). No offense to Karl, who had some big shoes to fill on sax, but I still dearly miss Bobby Keys on that one. Honky Tonk Women may be the one war horse I can never tired of hearing, that opening riff just slays me every time and when Keith puts the pick in his mouth to pluck that opener and then takes it out...well...you know. Let's Spend the Night Together was by audience request and was one of the songs I knew was gonna happen after being at sound check. It's another oldie, but goodie that I don't hear often and always enjoy. After band intros Keef was up and although I was hoping for a rarity, his standard Happy and Before They Make Me Run is always a hit with the crowd. He just looks so darn happy and appreciative up there it kills me. The last half of the show was the usual, beginning with Midnight Rambler and at the end Keith pointed to Mick to signal him out for some kudos. Then onto Miss You, Gimme Shelter, Start Me Up, Sympathy, Brown Sugar, YCAGWYW with a full choir and Satisfaction. Wow, the end so soon? It was the ONLY Stones show that I was completely by myself at during the entirety, with no a soul in sight that I knew. And it was kinda cool. A private moment to reflect on my past 21 years of Stones shows which started in the nosebleeds with binoculars thinking "How the hell do those people get in the front row? I wanna be there someday!" and culminated in hanging out backstage, and having a Friends & Family of the band pass and standing in the front row. I still pinch myself. Lose your dreams and you will lose your mind, right? Almost ALL of my Stones dreams have come true, and for that I am ever grateful to a slew of people over the years, namely BB & SL who have been more than gracious on many occasions. I walked through the backstage (yes!) out the back load out end of the stadium to my car as the smoke from the fireworks was clearing. I needed a beer badly! The smile never left my face, even though it took me an hour to get the 10 minutes back the hotel in order to meet my friends who graciously provided an after show pizza party in the lobby. It's Only Rock n' Roll, But I Like It! Here's to more shows in 2016!